Edward Snowden is portrayed as a traitor, a fugitive criminal and maybe even a Russian spy, but when he showed up in Washington he was greeted by numerous standing ovations. Edward Snowden is portrayed as a traitor, a fugitive criminal and maybe even a Russian spy, but when he showed up in Washington, he was greeted by numerous standing ovations. Despite government efforts to demonize him, Snowden looks a lot like the boy next door, maybe more idealistic than most but modestly understated when he talks about his sensational role as a world-class truth-teller. The boyish smile says, Aw, shucks, I’m not anything special. If the feds decide to prosecute this plain-spoken young citizen, they will find it very difficult to convince Americans he is an enemy of the people. At the National Press Club luncheon where Snowden made his surprise appearance, he was embraced as a national hero. He talked for fifteen or twenty minutes, even took a few questions. The applause was thunderous, the drama so enthralling I failed to take any notes. The Ridenhour awards event is an annual ceremony in Washington honoring public servants and activists, documentary film makers, authors or investigative reporters for their courageous accomplishments. Snowden and Laura Poitras, the film maker who has collaborated with him, received the Ridenhour Prize for Truth-Telling. The award is named for the late Ron Ridenhour, another brave truth teller who exposed the My Lai massacre during the Vietnam war. The annual luncheon, sponsored by the Nation Institute and the Ferlel Foundation, is always a warm-spirited tribal gathering for the left-liberal and progressive activists who labor for the public interest in the nation’s capital. Of course, neither Snowden nor Poitras was actually in DC. They appeared, live and in color, on a big screen on the wall of the banquet hall, linked by the marvels of modern communications. Snowden was presumably in Russia, no one said where Poitras was. The transmission was a little jumpy, so their words were often out of sync with the pictures, which added dramatic tension. James Bamford, the authoritative author of three investigative books on the surveillance agency, introduced Snowden–an influential endorsement in Washington circles. The press ignored the event, or maybe they were not informed in advance. Snowden and Poitras have had a lot of experience dodging the cyber-nets cast by government spies and spooks. Perhaps the most striking thing Snowden said was that when he decided to make public the treasure trove of National Security Agency documents he expected to spend the rest of his life in prison. He decided nevertheless it was “the right thing to do.” Poitras recalled the first time she heard from Snowden was an anonymous e-mail query in early 2013. As an investigative film maker, she was used to dealing with sources who dared not reveal themselves. As discussions progressed about what Snowden wanted to disclose, she was astonished by the scope of what he knew and even more astonished that he intended to go public. But Snowden made the point that his decision was neither frivolous nor reckless. His alarm at what NSA was doing to spy on Americans was widely shared among NSA technicians, he said. Rank-and-file workers saw the same abuses and were as upset as he was. NSA spies on more Americans than it spies on any other peoples, he said. But NSA insiders also knew that internal complaints were worse than useless. When internal whistleblowers had tried to follow procedure and file formal objections, they were stiffed or punished. If they went public, top officials insisted they were lying or delusional or whatever. 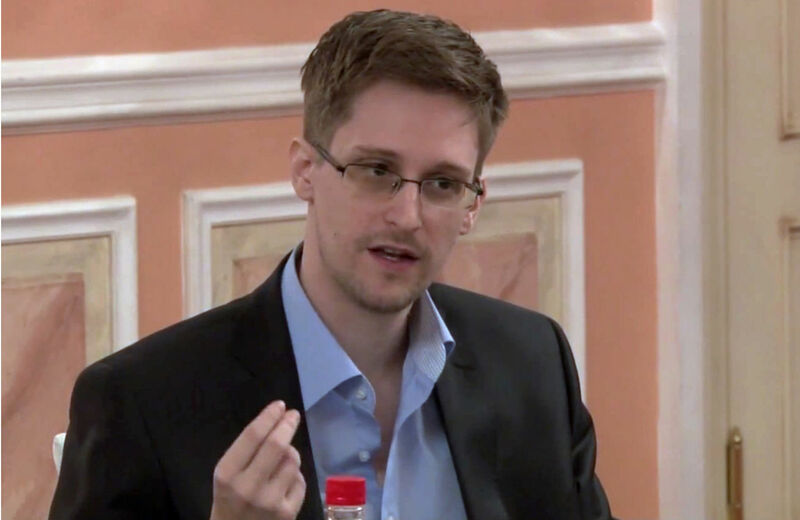 Snowden the citizen concluded that if he was going to act, he would have to supply the documents that confirm his shocking accusations. Otherwise, the system would simply brush off his truth-telling and likely punish him as the villain. So Snowden produced a veritable truckload of evidence. Whatever criminal offenses might be lodged against him, Snowden observed that James Clapper, the director of national intelligence, had lied under oath to the US Senate and nothing has happened to him. The president has not fired Clapper or even reprimanded him. Snowden made this point twice. Is NSA above the law? The more Obama protects these guys, the more their dirt will become his dirt. Meanwhile, Snowden’s manner is the opposite of rancor. He went on at length in defense of NSA people he had worked with, praised them as patriotic Americans proud of their work. He also addressed his family and apologized for the pain and anguish his actions may have caused them. His father was in the audience, evidently proud to see his son honored in the nation’s capital.